Robert Karinto is son of the makonde master Lidimba Karinto who died in 1992. He was involved with his brother Amandes in production of statues for George Lilanga which reached many galleries and museum worldwide. He lived just several meters from Lilangas house but recently he moved to farm south of Dar es Salaam. 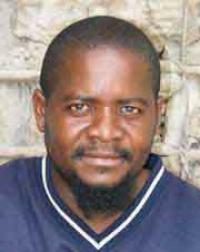 He was born in 1969 in Dar es Salaam but soon after divorce he followed his father to Mtwara where his tribe Makonde comes from. There he went to primary school. Then in 1988 they returned back to Kidai in Mkuranga district just south of Dar es Salaam. (so they had this farm and then the house near Lilanga). First he carved the shetani style but when there was rush for Lilanga he carved for him. But he didn´t paint them, it was somebody else… Now Robert Karinto has two children and wife. They live together with younger brother Amandes and Karintos younger brother at Kidai.